Death of a President, originally uploaded by Gene Bowker. 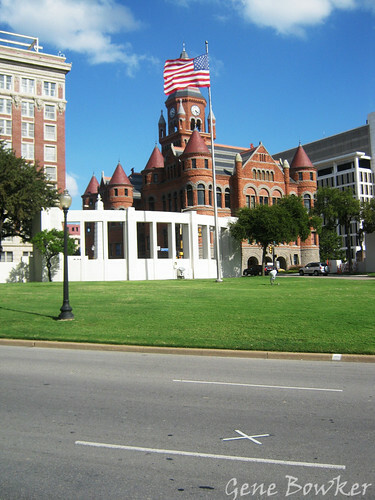 The small X on the pavement marks the spot where President John F. Kennedy was shot in Dallas, Texas in November 1963. No matter what theory you subscribe to regarding his death, the fact was that a sitting US President was killed. Of course, Kennedy was not the first US President to be killed in office. Hopefully, he WILL be the last. There is a lot of history in the East End of Dallas, Texas. I highly recommend a visit at least once in a lifetime. Cockshutt 40, originally uploaded by Gene Bowker. Back when this Cockshutt 40 was built quality still meant something. 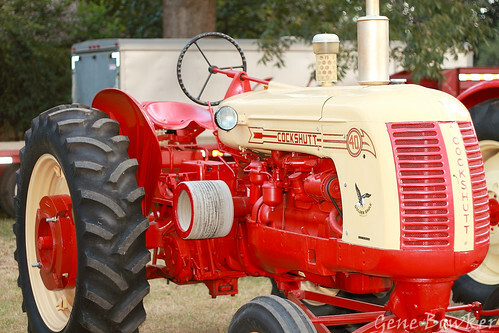 John Deere, Ford, and small players like Cockshutt made tractors for the American farmer which did what they were supposed to do, work. I'm glad a few of these veterans are still around for us to admire. Old Iron.. built in the 1950's with cool streamlining. The owner has these in great condition! Can't wait to see the rest of his collection at the Aiken fair in October. 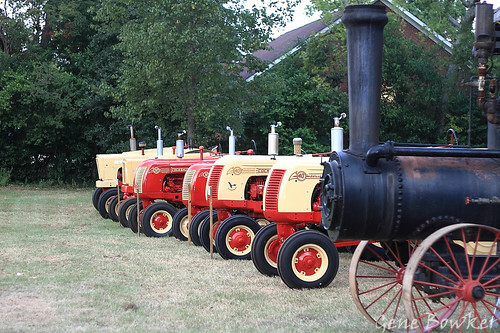 tractor lineup, originally uploaded by Gene Bowker. The old and the older line-up across from the new depot in Aiken, SC. The tractors are Cockshutt's and the steam tractor still works. 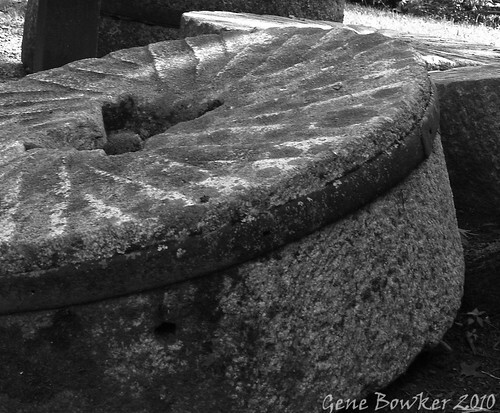 Millwheel, originally uploaded by Gene Bowker. When I think of Ansel Adams I think of Yosemite first and foremost. Then I think of his other works at the National Parks such as Yellowstone , Carlsbad Caverns (I have a print of one of those shots in my cubical), and in the Southwestern Indian Country. I have to admit that I was startled when I saw this picture was an Adams. Looking at it and especially when it was taken in 1941 you start to appreciate the fact that projects like the Boulder Dam (Now Hoover Dam ) were changing the face of the West. Adams realized this and took pictures of that change. It challenges me as a photographer to take the time to look at how the world is changing today instead of always focusing on what remains of the past. Documenting change as it happens so that in the future we remember both what was and how it became what it is today. NS3277 SD402 Hi nose, originally uploaded by Gene Bowker. 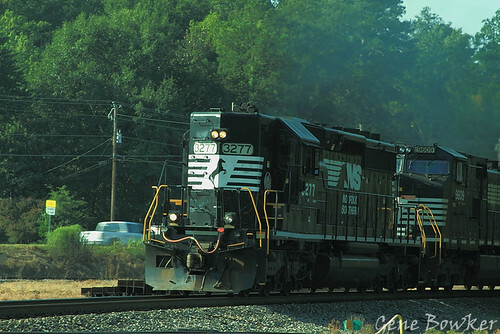 The Southern Railway which was merged with the Norfolk Western in 1981 to form the Norfolk Southern was famous for ordering locomotives with high short hoods and for running them with the long hood forward similar to a steam engine. Most other railroads ordered their engines with a low short hood to allow for better visibility and designed them for running with the short hood forward (as in this photo). Today seeing a high-hood is something special especially leading a freight train. It is only possible because one railroad didn't follow the heard but went it's own way. Don't be afraid to go your own way in life even if it seems a lot different from the normal. Someday your uniqueness will be recognized. 9/11 is a day for remembering not hate. 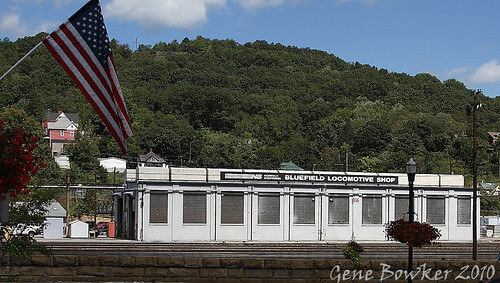 Bluefield Shops, originally uploaded by Gene Bowker. Tomorrow marks the 9th anniversary of the September 11, 2001 terrorist attacks on New York and Washington, DC. It serves as a memorial to those who lost their lives in the attacks and also to the public servants who lost their lives trying to save victims. Much like Pearl Harbor or the JFK murder every American remembers where they were when they first heard the news about September 11th . The flag in this photo reminds me of the months following 9/11 when everywhere you went there were flags flying from homes, flag stickers on cars and a genuine attitude of patriotism. That spirit of American oneness is not the same spirit that drives the ideas of burning Korans or other acts of stupidity which do nothing but stoke the flames of hatred. Instead of protesting 9/11 should be a day to celebrate the American spirit of resilance against attack and remember those who have died in the cause of freedom. Night Train BW, originally uploaded by Gene Bowker. Here is a shot of the next train coming down the tracks going away from my camera.. 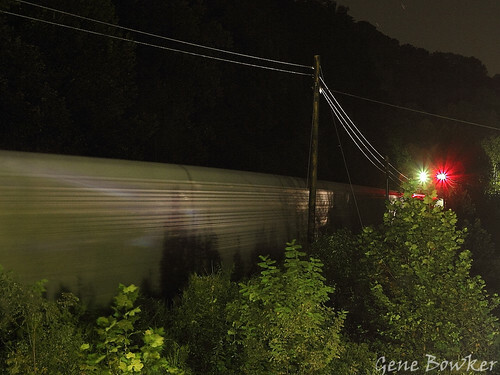 The reflection on the side of the locomotive can be seen as well as the lights of a car on US52 to the right. I like this one in BW. Night Autoracks 1, originally uploaded by Gene Bowker. This is my first attempt at time lapse night photography. I was amazed at the light gathering capabilities of the Canon EOS 7D when I took the shots I shared here. 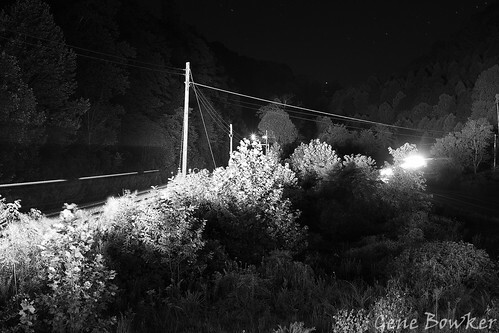 The camera was on a tripod on the Balcony of the Elkhorn Inn and the tracks are about 150-200 feet away when this was taken.. the light on the trees in the foreground came from a passing auto. This exposure was about 15 seconds with the ISO setting on H. Surprisingly there was little noise in the photo at the size I was shooting. This shot did have a lot of extra light provided by the cars driving through the shot on US52. How I spent my weekend.. or some photos from our trip to Southern West Virginia. Got up early on another foggy morning. Drove to Iaeger WV and got some photos there. Now going into Bluefield to visit some flea markets and get some lunch. Taken along the Augusta River levee, summer 2010.